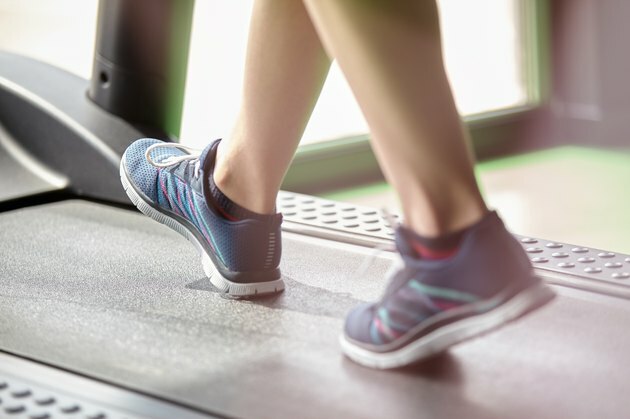 The treadmill speed sensor records the revolutions per minute of the front roller and the computer converts this reading to miles per hour. On most models, the speed sensor is connects to a circuit board that interfaces with the treadmill control panel. When problems develop with the sensor, the display panel might show an error code. Most often, this indicates a faulty sensor or one that’s loose. Testing the continuity of the internal circuits with a voltage meter is an effective way to identify problems with the speed sensor. From that point, the speed sensor can be fixed. Unplug the treadmill power cord. Use an Allen wrench to remove the bolts that secure the motor cover at the front of the treadmill. Depending on the model, it may be necessary to remove the hub covers on each side of the treadmill to access these bolts. Remove the motor cover and set it aside. Trace the black and white wire leads from the motor to the circuit board below. Pull the black and white connectors off the terminal posts on the circuit board. Locate the bolts that secure the treadmill motor to the mounting bracket. Use a socket and ratchet or Allen wrench to loosen and remove the bolts. Lift the motor at the end opposite the front roller pulley to slack the drive belt. Lift the belt off the motor pulley. Position the motor upright to access the speed sensor at the underside of the motor. Check the stability of the sensor in the bracket that holds it to the motor. If the sensor is not stable, use a screwdriver to tighten the screws and secure the bracket. Trace the wire lead from the sensor to the circuit board below. Pull the connector from the circuit board. Test the continuity of the speed sensor wiring circuit with a voltage meter. If the meter shows continuity, the speed sensor must be replaced. Install the speed sensor into the bracket at the underside of the motor and tighten the screws. Connect the wire lead to the circuit board. Put the drive belt on the motor pulley, reattach the motor to the mounting bracket and tighten the bolts that hold it in place. Connect the black and white leads from the motor to the circuit board. Put the hub covers on the sides of the treadmill frame. Attach the motor cover. Plug the treadmill power cord into an electrical outlet. Follow the owner’s manual instructions for resetting the treadmill. If you've misplaced your owner's manual, check on the manufacturer's website for a PDF version of the manual for your make and model of treadmill. Don't ignore the warning lights on your equipment. They're a signal that bigger problems may be ahead if you don't fix the smaller problems in a timely manner.